AirPlay is a new feature for streaming music, video and photos wirelessly from iPad, iPhone and iPod touch to Apple TV, transforming Apple TV into a great accessory for iPad, iPhone and iPod touch. iOS users also will be able to use AirPort Express and AirPlay to stream wirelessly to any stereo or powered speakers, or directly to AirPlay-enabled speakers coming to market in the months ahead. AirPrint is a next-generation Wi-Fi print architecture that dramatically simplifies printing by completely eliminating printer drivers. A selection of AirPrint enabled printers including the HP Photosmart, HP LaserJet Pro and HP Officejet will be the first to support printing direct from iOS devices. iPad, iPhone and iPod touch users can simply tap to print their documents or photos wirelessly to any printer that supports AirPrint. 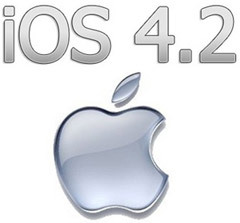 The iOS 4.2.1 is available for download to iPad, iPhone and iPod touch and it is compatible with iPad, iPhone 3G, iPhone 3GS, iPhone 4, second and third generation iPod touch (late 2009 models with 32GB or 64GB) and new iPod touch. To update to iOS 4.2.1 all you need to do is to connect your device with your computer via USB and start syncing with iTunes 10.1.